When? 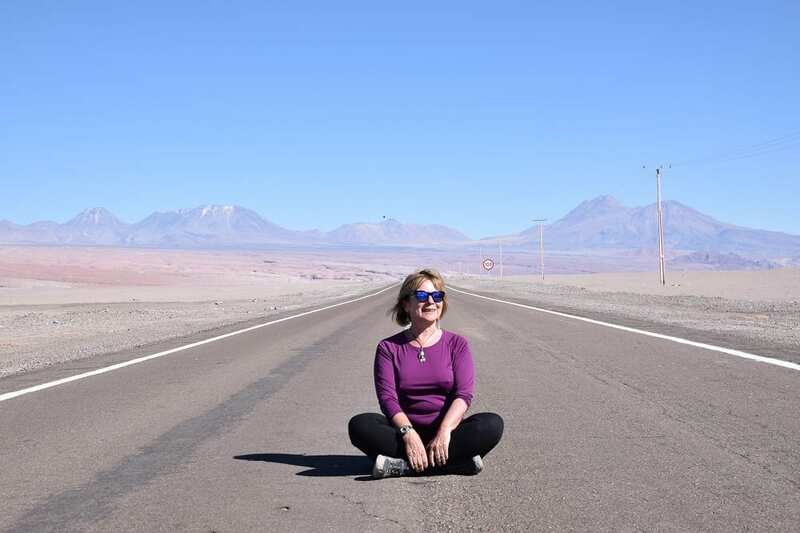 December 2018 – first leg with a side-trip to Bolivia , then on to Antarctica. I wake to an incredible view of the Andes, snow spattered. The plane is descending, before commencing a sharp, and slightly alarming, ninety degree turn into Santiago, just the other side of the mountain range; there isn’t much space between me and some of the frosted peaks I’m eyeballing. We pop, not entirely smoothly, over some glistening salt pans, before coming into land. The airport is both surreal and uncomfortable. Surreal, because the loudspeakers are blaring out Christmas carols, mainly in English. Uncomfortable, because packing for climatic extremes: desert, Caribbean and Antarctica on this trip, has been fiendishly challenging. I’ve finally decided that being too hot is preferable to being too cold and travelled in my parka, Ugg boots and fleece, after stuffing my case to the maximum limit. So, I’m sweltering in the thirty-degree heat. What’s more, my cabin bag has developed a mind of its own and keeps keeling over. So far, it’s taken out a display of bottled water and an unsuspecting toddler. Unsurprisingly, I’m on the receiving end of raised eyebrows from the Chilenas. It doesn’t help that the check in clerks and immigration officials are struggling to understand my native tongue. My rusty Spanish is going to have to improve speedily if I want to have any conversation. Unless I content myself with listening to the music, of course. Immigration is quiet and the queue very short. One of the operatives has closed her window and is using her phone to photograph girls in bikinis from a catalogue. I’m not convinced this is a work-related activity. I’m also wondering what the Australians have done to upset the Chileans. Whilst everyone else gets in free they have to pay a $116 fee before they’re allowed in. The next plane heads to Calama, reversing the route I’ve just taken into the capital and skimming the mountains again. If anything, the outlook is even more stunning, zebra striped ridges running to the horizon, teeny turquoise lakes perched aloft. Travelling north, the landscape flattens, cinnamon tinged with sage, dotted with huge crinkly salt pans. 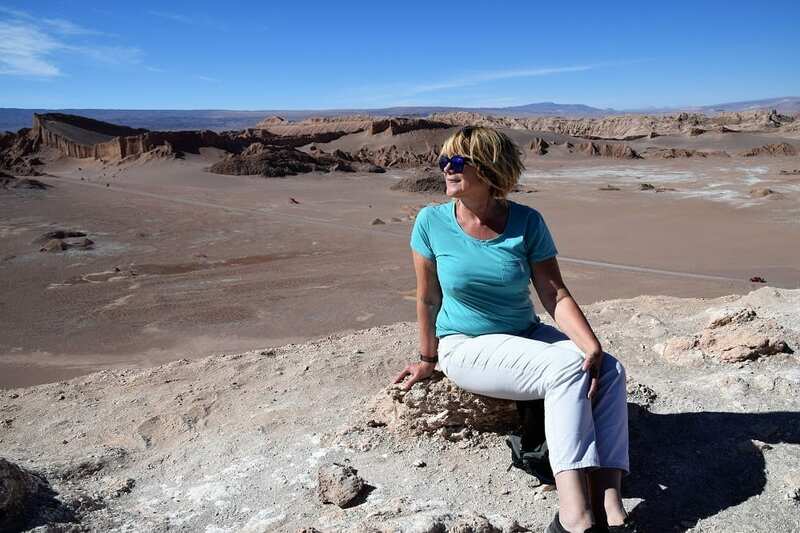 My first port of call proper is San Pedro de Atacama, an oasis in the Andes foothills. 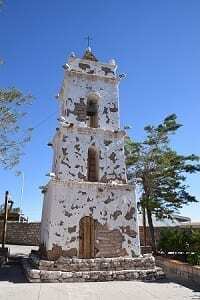 The little town is presided over by the perfect volcanic cone of Mount Licancabur and the desert from which it takes its name is the driest in the world. San Pedro is awash with white minibuses, mostly plying the same tourist routes. I’m in a group of five, with a guide called Melina and an excitable trilby wearing driver, Christian. My companion travellers are two couples, Chilean and Spanish, both on honeymoon. The guide’s comments about the Spanish invasion, while she’s explaining the history of the region aren’t going down too well with the Spaniards. It makes a change from being under fire for British colonialism. San Pedro is at an altitude of 2500 metres and we are climbing up to 3500 metres in the Domeyko Mountains. It’s an extraordinary lunar landscape, the distant Andes an ongoing beautifully contrasting backdrop. Much of the desert here is starkly arid, but nearer town the road is lined with yellow grass clumps. giving the hills a golden hue. 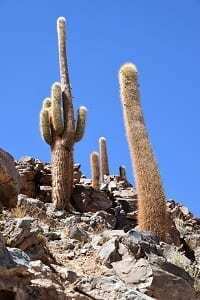 Groups of sleeping sheep turn out to be huge cacti pincushions, known here as mother-in-law’s plants, far more vicious than our mother-in-law’s tongue. First stop, petroglyphs at Yerbas Buenos. These are mainly drawings of llamas and shaman, rays emanating from their heads. I’ve yet to learn to appreciate petroglyphs even though I know they’re ancient. Or relatively so in the case of these – 1400 AD. The contrasting starkness of the rocks against the sapphire of the sky, chasms, bridges, caves and peep holes is more interesting. Rainbow Valley, though not exactly rainbow- mainly tones of green and brown- is worth the trip alone. The towering formations are stunning – pistachio ice cream dribbling chocolate sauce. I’ve just read an article that says I should leave Rainbow Valley to the end of my stay here because of the high altitude. Onwards and upwards. Time to sit by the pool before my next excursion. Nothing is arranged during early afternoon here, as it becomes very hot. And besides it’s obligatory to visit most of these sites at dawn or dusk in order to get the best light. I’ve said that the desert looks like the moon (or how I imagine the moon to look, but my next stop is actually called Lunar Valley. It’s a huge bowl containing a steep walled amphitheatre and a multitude of incredible spindly rock formations. It’s surrounded by giant sand dunes and Toblerone ridges snaking our in all directions. We ascend a path running alongside the Duna Major. It’s an assault course type work out – it’s sandy as well as being at altitude. The toilets at the bottom are closed and there’s no cover at all. But the unique panorama at the top is definitely worth it. We’ve just beaten the crowds. The file of folk struggling up the hill is growing steadily. I’m told it’s low season in San Pedro. When it’s really busy there are a thousand people standing on the top of the dune alone. There are several more lofty miradors with views across the whole landscape, each of them charging for entry. Nothing is free here. But at least they’re more accessible, though It’s cooling down as rapidly as it heated up and there’s a wind whipping up too. The tiny particles it’s carrying are painful. No wonder there is so much erosion. The sunrise rule has been applied with a vengeance today. 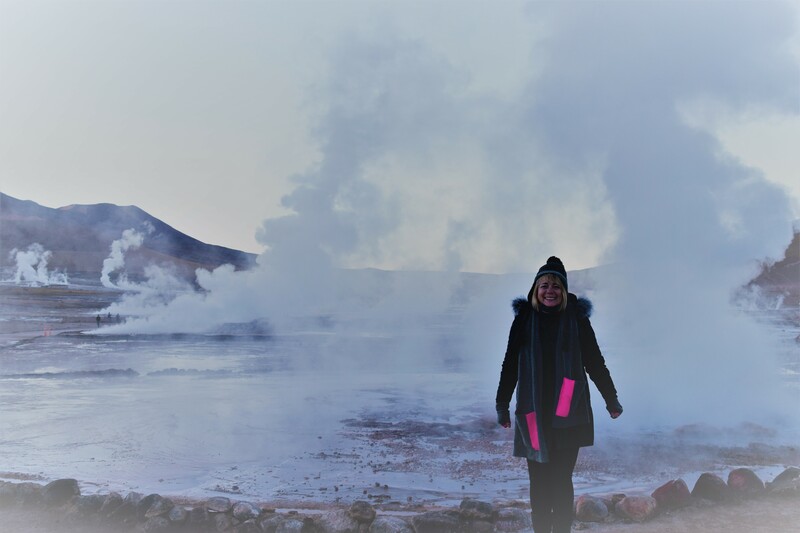 And summer timetable has just come into force, so I’m picked up at 4.30 a.m. to see the Tatio geysers. Not only do they look good at sunrise, the blurb says, but they only erupt properly at this time of day. Thank goodness my body clock is still on English time. The geysers are all named after people who have fallen in and died: Geyser Belgium, Geyser Italia. And even more morbid, Geyser Killer. The owners have at least walled in the deadliest of the eighty or so spouts, curls of steam rising high into the sky wafting sulphur. There are some reflections in the pools, but It’s prettier when the sun rises, and the columns are framed by an azure sky. However, the pre-departure information is accurate. They’re indeed all dying down as the sun climbs over the mountains. It’s 4.300 metres high here and the rapid ascent is taking its toll today. I’m feeling nauseous and giddy. If I’m not careful they’ll be naming a geyser Britannia next. The climate is schizophrenic. The fumaroles are bubbling scalding water from salt encrusted funnels and there’s ice on the ground. It’s hard to know which is which. It’s minus eight degrees at the moment and I’m so glad I brought all my togs. Swimming is on offer, in a thermal pool, but dizziness and cold air don’t promise enjoyable swimming and the pool is already rammed with tourists. It was pitch black on the way up, and anyway I was attempting to doze then, so the scenery on the descent is another welcome surprise. 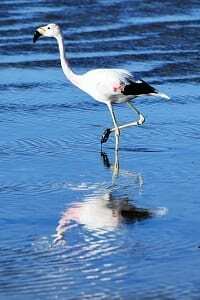 There are more golden tinged peaks, narrow winding passes and a wildlife bonanza: foxes (Zorro of course) vicuña, rheas, a multitude of waterfowl in a patchwork river valley and flamingos on the salt pans. A final unexpected stop turns out to be the highlight of this excursion. Cactus Valley is an absolute gem of a walk, through giant six-hundred-year-old cacti to a bubbling waterfall. All that and it’s not even noon. 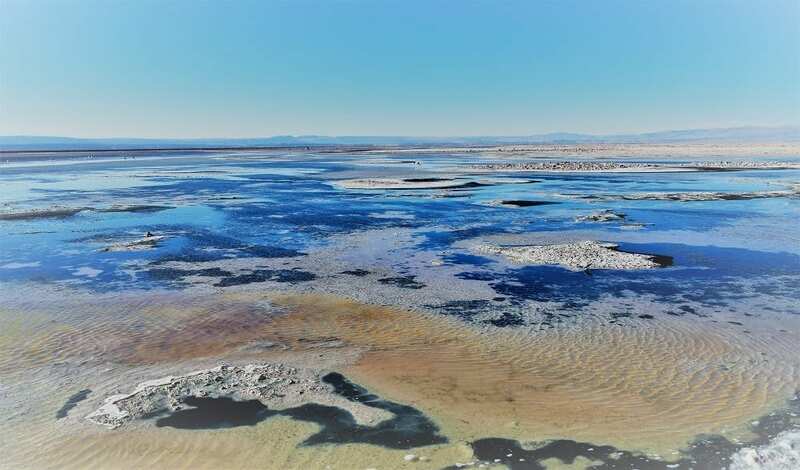 The San Pedro finale is a visit to the salt flats. Here the wind is balmy and the atmosphere tranquil. The flamingos put on a good performance with their synchronized mating rituals, wading in pairs, their heads dipping as they sieve the water, or abruptly take off, candy floss and liquorice wings fluttering. A lone male does his utmost to attract attention, waggling his wings and stiffening his neck, but to no avail. Eventually he folds his coral pink head under his wing and sulks. This desert truly has everything. Round the back of Mount Licancabur to the border post The Chilean immigration service have been taking tips from the Chinese. I’m made to get back into my van because I hadn’t been given permission to get out. The toilets aren’t working either. On to Bolivia. See Bolivia for the next section. Back in Santiago I’m picked up this time by a fussy little man called Maurizio, who talks non-stop for 20 minutes in unintelligible English and delivers me to a very smart boutique hotel. I’ve time for a wander round down town. It hasn’t changed my opinion. Santiago is a pleasant enough place, more than pleasant if you want to shop (plenty of those) or eat out, especially around the bohemian Lastarrio barrio with its many small bars and cafes. But there isn’t really anything exciting to look at. There’s a small dirty river running through the middle, lined with some park areas and statues and a hotchpotch of building styles, some old mixed in with the new if you look hard and upwards. 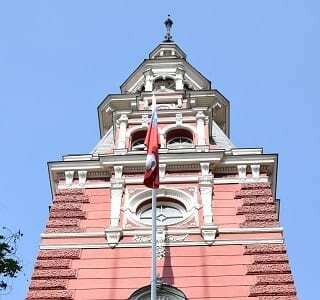 There’s a presidential palace, an imposing cathedral on the main square and several other spires or older colonial style buildings (such as the old fire station) interspersed with the many shopping outlets and street stalls. There’ s also a domed central market building. The highlight is an ice cream at a street café which serves the most enormous sundaes I have ever seen -for sharing obviously. I order a smaller tub version with two flavours. Or I think I have. Two huge tubs turn up – fortunately, they take pity on me and refund one of them. Maurizio has sent a message to say that the ground staff from LATAM (the airline amalgamation of Chilean LAN and Brazilian TAM) are on strike today and I have to leave early for the airport, at noon. Last time I was in South America the Argentinians were on general strike and this time it’s been both Bolivia and Chile. It’s hardly the way to encourage tourism. The message is delivered while I’m in the bar on my second pisco sour. I’m still tired, so I go to bed at nine. I’m woken up at 10.30 by the phone. Maurizio wants to make sure I’ve got the message. It’s not been a great night again. My stomach has been playing up and I feel fluey. Perhaps the pisco sours weren’t a great move. Maurizio phones at 11.30 to say that he is downstairs waiting for me. It takes twenty minutes to get to the airport, check in is quick and it seems that all the planes are on time. So, I’ve three hours to wait listening to those Christmas carols again. Déjà vu. Maurizio has wanted to wait with me, but I’ve declined his offer, he even tells me how much to tip him. Apparently, I tried to give the driver too much. Not quite all the planes are on time. The Puerto Montt flight scheduled an hour before mine has been indefinitely delayed. They’ve announced over the PA that the pilot hasn’t turned up for work. What’s more no-one can track him down and he won’t answer his phone. The plane is still sitting at the gate as mine taxis out. Puerto Montt is the gateway to the Chilean Lake District. It’s actually set on a large sea inlet that looks like a lake but isn’t. Charles Darwin proved that when he landed there with the Beagle. 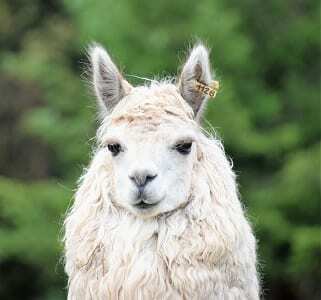 It’s very English countryside, green rolling hills and pasture, where the llamas, for the most part, have given way to Jersey and Guernsey cattle. The first settlers here were German though, so the villages are wooden chalets and pastel timber churches and the roads are lined with signs advertising Kuchen and Zimmern. The waterside resorts, with red canopied cafes and restaurants, are more Little Switzerland; it’s like being on Lake Neuchâtel. However, it’s not really Switzerland, Germany or England, as there are also volcanoes. I’ve come here because last time I was in Chile I flew over the area and the view of the cones from the air, all venting, was entrancing. I decided I would come and see them from the ground. 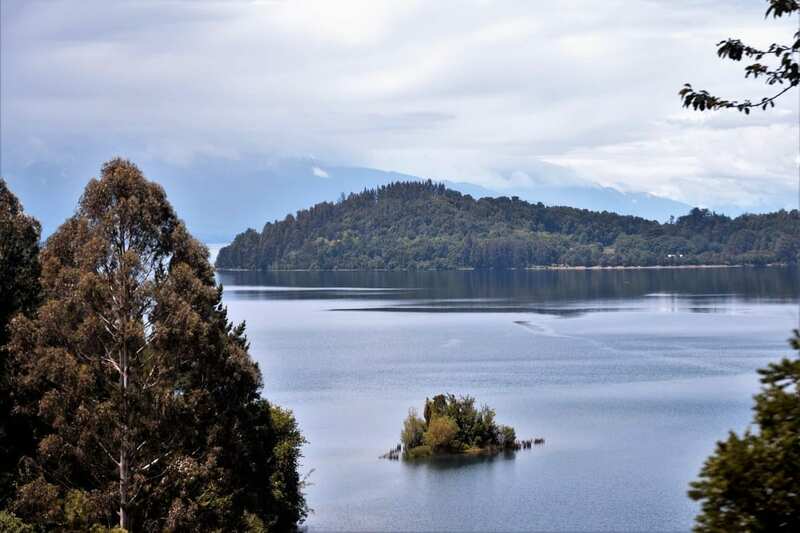 My hotel is in Puerto Varas, on the edge of a very large lake, Lianaquihue, and I’m told that there are two very large volcanoes just across the water from my room. But I will have to take everyone’s word for it. The climate is the same as that of the English Lake District and there are dark clouds; it’s threatening to rain. So today I bounce off the bus when we stop and set off for the Petrohue Falls again, ticket in my pocket. But the entrance gate is padlocked, and a gloomy little man explains that they’ve been closed by the police. Some robbers are hanging out down there. Next, a return visit to the small lake, where I embark on a boat for an (almost two-hour) voyage to a very small village called Peuilla. It’s probably a very scenic ride, with beautiful mountain views – it’s in a narrow valley – but it’s raining steadily today, and I can see very little. I spend most of the time talking about travel, with an English lady called Tricia. There’s four hours to spend at our destination. Canopy walks, more boats, 4 WD trips and llama farms are on offer, but it’s still bucketing down. And besides I’ve had enough of boat rides with elusive views. There are some comfy sofas in the local hotel. And I still have my Kindle. Back across the lake, still chattering to Tricia. The Falls are now open. It’s third time lucky, so I brave both the lashing rain, slippery paths and a party of students, (but no robbers) to get my pictures. I saw part of one of the volcanoes this morning through a rosy sunrise. Sadly, still no view of the cone. And now it’s raining again. Today, another group excursion (never again) to a village, Frutillar, on a clockwise circuit of Lake Lianaquihue. The rain is interspersed with sun and the meadowland is pretty. The guide ekes out the short journey by telling us all about the few factories we pass. However, the main industry here, unsurprisingly, is dairy, producing almost enough to supply the whole country. The lake is a pretty turquoise and there are plenty more wooden buildings, old and new. Frutillar has a modern timber theatre, built over the water (it’s not quite Sydney Opera House) and a little museum, with reconstructed colonial buildings. One affluent hamlet has clutch of houses that cost over a million dollars each. The guide says they boast a view of six volcanoes in all. Naturally, we can’t see them. A plane south to Punta Arenas. LATAM sold my booked seat to someone else, as they do, so I’m in my least favourite middle of the row seat. At least they didn’t bump me altogether. The upside is that I’m entertained by Californian Mike by the window, who is leading a team of ten to film pumas in Torres del Paine. My hotel is a tall town house at the top of a hill with glassed in restaurant. Here’s a first – my bag is winched up onto the balcony, which has a great view over the most southerly city (on the mainland) in the world. Punta Arenas is much as I remember. It’s an orderly little town, blue, green and red roofs, sweeping down to the sea. There are some stately civic buildings around the central Plaza des Armas. The air is fresh but not too windy. I’m having a catch-up day. Hairdresser, nails, eyebrows, massage with Cecilia, who performs each operation in a different room of her house. It’s a pleasant way to relax. An uber back to the hotel, the driver gets lost, but instead of charging me extra for the additional time, he deducts money from the charge and refuses to take any more. Amazing. In the evening an information meeting, flights and arrangements for my trip to Antarctica tomorrow. Chile is one of the longest countries in the world with a coastline of around 6500 km long. However, it is also one of the narrowest in the world with a width of just over 200 km. 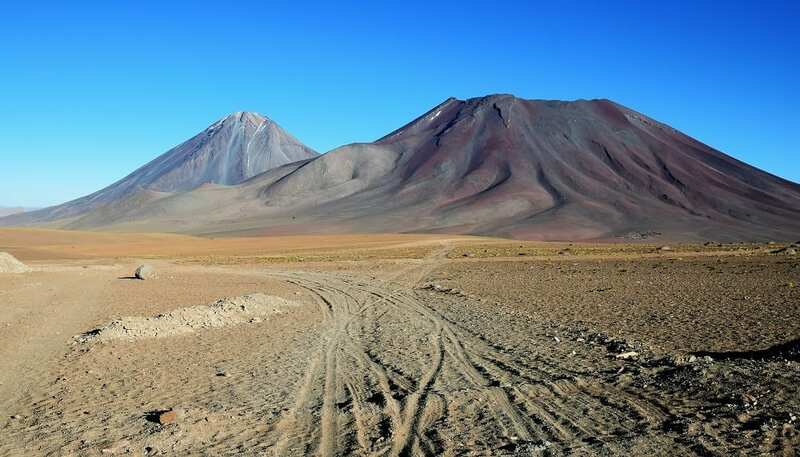 At a count just over 1300, Chile is one of the countries with the most volcanoes and several of them are still active. 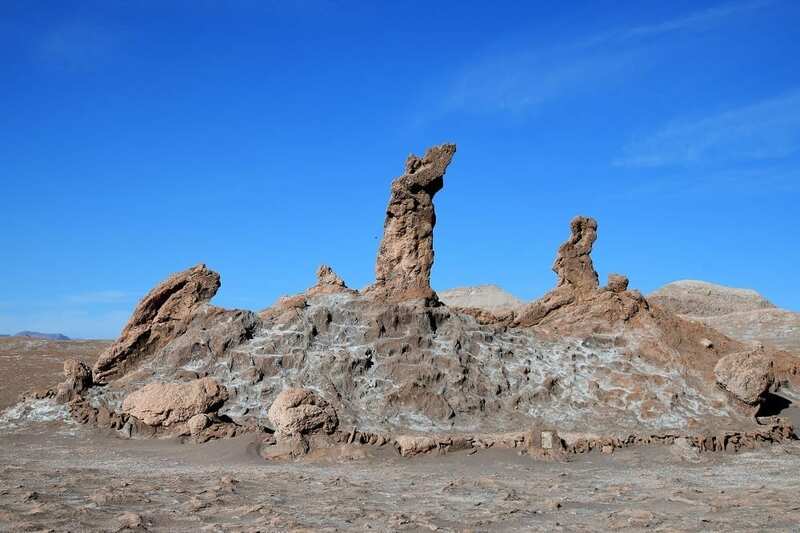 The Atacama Desert is the driest place on earth. To see more of my photos of Chile, visit this page.